This is the second post in a two-part series discussing how businesses are increasingly being held liable if their websites are not compliant with the Americans with Disabilities Act. The first post, "The Internet and ADA: The Right to Equal Enjoyment of the Web," provides background on this growing trend in regulation. As we mentioned in our last post, the Department of Justice (DOJ) has shown an increasing interest in ensuring that goods and services offered online are equally accessible to persons with disabilities. While the DOJ’s proposed regulations on website accessibility have been in the works for years, it has delayed its target date for regulations—now set for June 2015—several times. But in the meantime, it has not hesitated to investigate alleged violators. In fact, the DOJ indicated it will continue to enforce ADA website accessibility on a case-by-case basis until the issue is addressed in a final regulation. While the risks of noncompliance vary, they can be costly. For example, in a March 2014 consent decree, subsidiaries of H & R Block agreed to pay $45,000 to two individual plaintiffs and a $55,000 civil penalty. The DOJ’s most recent settlement on the issue provides valuable guidance on what companies can do now to help make their websites more accessible. The most recent settlement, reached in mid-November of last year, involved Ahold U.S.A. Inc. and Peapod LLC, the owners and operators of large Internet grocer www.peapod.com. The settlement with Peapod is significant not only because Peapod operates exclusively online, but also because it highlights the DOJ’s increasing approval of the Web Content Accessibility Guidelines (WCAG) 2.0 as reputable standards governing website accessibility. The WCAG 2.0 guidelines emphasize four principles in its framework for achieving accessibility: making websites perceivable, operable, understandable, and robust. Perceivable: Pages should provide alternatives for text and media, create content that can be presented in different ways, and make it easier to see and hear content. Operable: Pages should make all functionality available from a keyboard, provide users with enough time to access features, avoid designs that are known to cause seizures, and provide tools to help users navigate the page. Understandable: Websites should strive to make content understandable and predictable and provide mechanisms for users to avoid and correct mistakes. Robust: Websites should maximize compatibility with current and future assistive technologies. After the DOJ concluded that Peapod’s website was not accessible to certain people with disabilities, Peapod agreed to make several changes to its operations, including: (1) designating an employee as web accessibility coordinator to report directly to an executive; (2) retaining an independent website accessibility consultant; (3) adopting a formal web accessibility policy; (4) soliciting feedback from website visitors regarding the accessibility of its website and mobile applications; (5) providing accessibility testing; and (6) providing mandatory annual training to website content personnel on how to conform web content with WCAG 2.0. and the ADA. The settlement is very similar to the consent decree with H & R Block in March 2014, though Peapod was not required to pay damages or a civil penalty. After the settlement with Peapod, another government agency indicated its approval of the WCAG 2.0., Last month, the U.S. 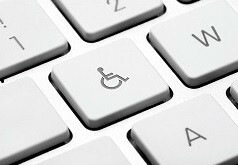 Architectural and Transportation Barriers Compliance Board, the federal agency dedicated to promoting equality for people with disabilities, issued a proposed rule regarding website accessibility for government websites. The proposed rule adopts WCAG 2.0 as the standard for federal government websites, further evidencing growing support for the criteria set forth in WCAG 2.0. Implement a plan for making content more accessible. Strive to include captions for all video and other multimedia content. Businesses that lack the ability to make their websites accessible can still comply with the ADA by providing an accessible alternative—such as a staffed telephone line—for individuals to access the information, goods, and services contained online. But remember, in order to meet the obligations under the ADA, the alternative must provide an equal degree of access in terms of hours of operations and range of information, options, and services available as its webpage. That means if certain aspects of a website are available 24-hours a day, then so too must the alternative. By implementing as much of the WCAG 2.0 guidelines as possible—and providing an accessible alternative if compliance is not possible—entities with a web presence can help ensure that users with disabilities have equal access. In the process, businesses may also discover that accessibility not only promotes goodwill, but also pays for itself.